Dr. Amy Kramer has a long history in the human and animal physical therapy world. She began her career with a Bachelor of Arts degree in Physical Education and Recreation, went on to work as a human physical therapist in an orthopedic practice for seven years prior to receiving a Masters and a Doctorate of Physical Therapy degrees in Physical Therapy. In 2004 when her own dog had knee surgery and needed post-operative services she became interested in animal rehabilitation, and pursued a Certificate in Canine Rehabilitation through the Canine Rehabilitation Institute. She went on to start the first Veterinarian and Physical Therapist owned rehabilitation clinic in Southern California and seven years later founded Beach Animal Rehabilitation Center (BARC). Dr. Kramer has been a member of the American Physical Therapy Association since 1991. She spends extra time trying to help integrate the veterinary and physical therapy communities getting them to recognize the benefit of combining their knowledge and expertise to improve outcomes. 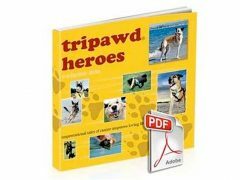 She has been applying skills she learned and used in the human world to the animals with tremendous success. Learn more about Dr. Kramer’s work at BARC. 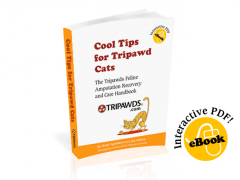 Find more amputee pet rehab tips and video interviews with Dr. Kramer at Tripawds.